I have been reading Donald Miller’s book A Million Miles in a Thousand Years, highly recommend it. This book is Miller’s reflection on working with producers on the movie version of Blue Like Jazz. Turns out, life isn’t like the movies…most of us wouldn’t make good movie characters. As Miller reflects on their take on his life and the producers’ need to spruce up his story a bit he realized his own need to live a better story than he had been living. Great book. I will share more thoughts on it later. While reading this book I have been more in tune with the power of story.Turns out, it’s everywhere…everyday. This evening the our boys, ages 2 & 4 were playing. As I listened to the imaginative things they were saying, it dawned on me that when children play they create stories. Play is their work and that work often involves one of two things: the construction of false play narratives that are impractical and impossible. Second, play often co-opts existing narratives and changes some of the essential components of the narrative to be more appealing to them or try things out…like when they say things to their stuffed animal or younger brother that they hear their parents say. So I hear the boys playing in Elijah’s room. Elijah is standing on his big firetruck. It was parked up against the wall, right under a brown tree we had painted in the nursery. Missy painted this tree when we set the room up for Jonah as a family tree, to be able to teach the kids where they came from. After we painted it, we hung pictures of family members on its branches so we could teach them who they (the kids) are, who their relatives are and where they came from. So back to Elijah. He is perched up on the side of his firetruck, his back to the wall and says…”I’m Jesus!” Jesus on a tree, right? He is playing Jesus. Jonah says, “Put out your arms.” It was stunning. We painted that to show them where they came from. The tree hasn’t ever shown it more clearly than today when looking at that tree reminded me that God put his own Son on the cross for us. It is where we came from. It is part of who we are. What happened next was play that was a reflection of real life…it wasn’t meant to be that but it taught me something important that I won’t ever forget. 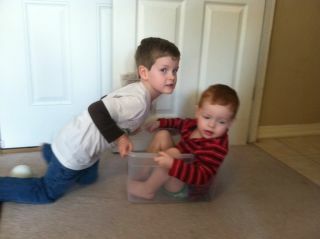 Moments later, Elijah got into a plastic bin and Jonah proceeded to push and pull Elijah around the house in that bin. He said it was Elijah’s car and he proceeded to “drive” him around the house. Aren’t we like that? One moment it is about the cross and identity and things of great significance…the very next we are back to our silly and senseless games! It is like going to church on Easter just to go back to life as usual on Monday. One moment, we are attentive to the story of the cross and the next something mundane and silly doing some sort of adult equivalent of pulling a 2 year old around in a plastic bin. I read this one a few years ago. Also loved it. But after some reflection, I have some critical feedback. Next time we’re together this is one we should talk about. I’d love to pick your mind about it.